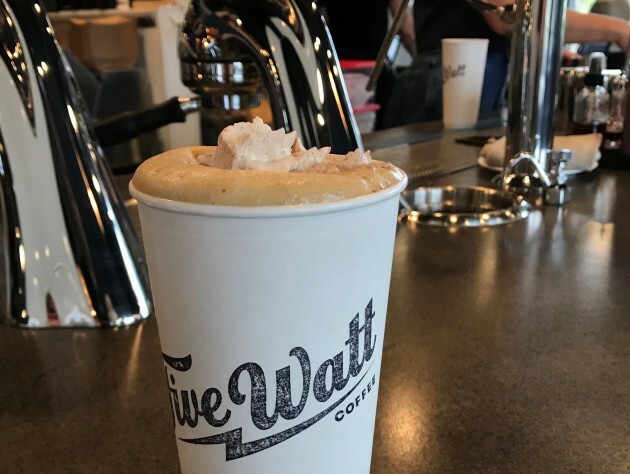 Big Watt Cold Beverage Co. continues to expand, debuting its second Five Watt coffee shop in northeast Minneapolis last week, and broadening its offerings to include food, beer, wine and low-proof cocktails. The new iteration, in the Miller Textile Building at 861 E. Hennepin Av., offers the same craft coffee drinks that Five Watt gained a reputation for, as well as new, playful sippers — such as the cheekily named Venti Starbucks Pumpkin Spice Latte, which arrives in a 20-ounce paper cup that the shop created specifically for it, complete with a mound of house-made cinnamon whipped cream. “We’re just waiting until [Starbucks] hits us with the cease and desist letter and then we’re going to call it the Pumpkin Spice Lawsuit,” co-owner Lee Carter said. Meanwhile, they plan to roll out low-proof cocktails this week with a Midori Collins, a sake-coffee mashup and a nitro-infused apple liqueur sour — topped with pop rocks. Food options include paninis and a handful of hot dogs, such as the Gochujang piled with slaw, Sriracha and cilantro. Carter and co-founder Caleb Garn opened Five Watt's original location in the Kingfield neighborhood in 2014. Soon after, they and partner Jason Westplate began expanding to make cold press cans and later, cocktail bitters. The new location will keep several of the staple specialty drinks that played a big role in elevating the Twin Cities' craft coffee scene. The Big Easy — cold press with chicory and nutmeg simple syrup and black walnut bitters, and The Kingfield — espresso with vanilla, coriander bitters and black sea salt — both make the move. "The Kingfield, that's our classic," Carter said. "People come from all over to get it."